Phonetic: Sit-tah-coe-sore-us (The ‘P’ is silent and is not pronounced). Named By: Henry Fairfield Osborn - 1923. 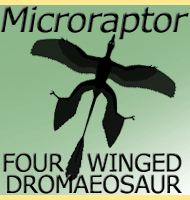 Classification: Chordata, Reptilia, Dinosauria, Ornithischia, Ceratopsia, Psittacosauridae. Species: P. mongoliensis (type), P. gobiensis, P. lujiatunensis, P. major, P. mazongshanensis, P. meileyingensis, P. neimongoliensis, P. ordosensis, P. sibiricus, P. sinensis. P. xinjiangensis. 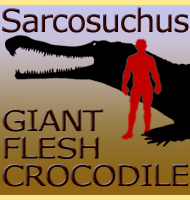 Size: Up to about 2 meters long. Known locations: China, Mongolia and Russia. Possibly also Thailand. Time period: Barremian through to the Albian of the Cretaceous. 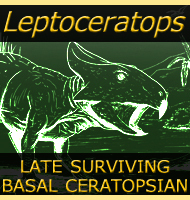 When it comes to the study of ceratopsian dinosaurs,‭ ‬it is the genus Psittacosaurus that has the most significance.‭ ‬The remains of literally over four hundred individuals are known,‭ ‬a few of these complete,‭ ‬articulated and with soft tissue remains such as skin and feather impressions.‭ ‬It is also possible to study the entire lifespan of Psittacosaurus with the remains of numerous juvenile individuals from hatchlings to sub adults also in a high state of preservation.‭ ‬In addition to all this,‭ ‬at the time of writing Psittacosaurus has the largest number of species attributed to it that any other dinosaur genus. Psittacosaurus lived during the early Cretaceous,‭ ‬and because fossils of Psittacosaurus are so numerous and only known from this period,‭ ‬the genus has now become established as a biochron.‭ ‬What this means is that when scientists discover Psittacosaurus remains,‭ ‬they can be confident that they are dealing with an early Cretaceous aged deposit.‭ ‬Because of its appearance in the early Cretaceous and display of primitive features,‭ ‬Psittacosaurus is considered to be one of the most primitive ceratopsians we know about,‭ ‬and a likely reflection of the distant ancestors of later,‭ ‬larger and more famous ceratopsian dinosaurs such as Triceratops and Styracosaurus. 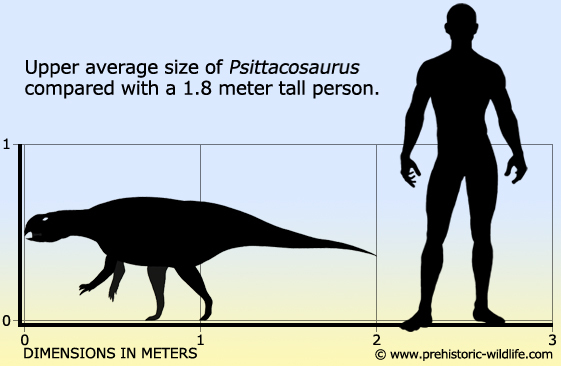 Psittacosaurus seems to have averaged about two meters in length,‭ ‬with some species such as P.‭ ‬lujiatunensis and P.‭ ‬sibiricus being the largest at just over two meters long,‭ ‬while P.‭ ‬ordosensis is the smallest established species with a length of under one and a half meters long.‭ ‬Species of Psittacosaurus are usually differentiated by the shape of the skull,‭ ‬particularly differences in length,‭ ‬height,‭ ‬roundness,‭ ‬as well as additional features such as bony lumps. We need to be clear that although Psittacosaurus was a ceratopsian dinosaur,‭ ‬it lacked the elaborate horns and neck frills that are commonly seen in later relatives.‭ ‬Some species are noted for having bony lumps growing from their skulls which may have been analogous to the horns of later relatives,‭ ‬but this is the exception of the species,‭ ‬not the rule of the genus. Psittacosaurus had teeth that were adapted for slicing through plants,‭ ‬and their arrangement and wear patterns show that they sharpened themselves.‭ ‬Because Psittacosaurus were unable to grind food in the mouth,‭ ‬they are thought to have used gastroliths to grind food in the stomach,‭ ‬and some Psittacosaurus have been found with rounded stones within what would have been there stomachs in life.‭ ‬The lower jaw of Psittacosaurus seems to have been capable of a sliding action that would have aided shearing of‭ ‬tough plants.‭ ‬It has been speculated that Psittacosaurus were probably selective browsers with a preference for certain plant parts including but not limited to parts such as seeds.‭ ‬A seed rich diet would also support the need for gastroliths since shearing teeth would not be suited to dealing with things like seeds. There is some evidence that proves that at least some species of Psittacosaurus had a row of quill like feathers that ran down from the pelvis to the tail.‭ ‬These quills would have been of little use in either insulation of defence,‭ ‬but they would have been very good structures for display.‭ ‬In terms of scales,‭ ‬Psittacosaurus seem to have had patterns of larger scales surrounded by smaller one,‭ ‬a type of arrangement that has also been seen in some other later and more advanced ceratopsian dinosaurs. There are at least two known discoveries of several juvenile Psittacosaurus that had been preserved together.‭ ‬What is interesting about this concentration though is that the juveniles were of different ages which has led to the idea that juvenile Psittacosaurus would‭ ‬congregate together into groups,‭ ‬perhaps to give them better protection from predators.‭ ‬One collection of Psittacosaurus juveniles‭ (‬DNHM D2156‭) ‬was once claimed to be proof of parental care in Psittacosaurus because the skull of what seemed to be an adult Psittacosaurus was found with them.‭ ‬However a later study‭ (‬Zhao,‭ ‬2013‭) ‬discovered two problems with this interpretation.‭ ‬One was that the‭ ‘‬adult‭’ ‬skull was actually from an individual that was six years old at the time of death,‭ ‬and study of other Psittacosaurus fossils has shown that Psittacosaurus did not reach reproductive maturity until ten years of age.‭ ‬Two,‭ ‬the‭ ‘‬adult‭’ ‬skull was found to have been glued to the slab with the juveniles upon it and bore no evidence whatsoever of belonging to the rock that the juveniles belonged to. The realisation that the more adult skull had been added by someone who no doubt wanted to increase its saleability to a collector,‭ ‬there is know no direct evidence that Psittacosaurus cared for their young.‭ ‬This does not disprove the idea for parental care entirely,‭ ‬it still may have happened,‭ ‬but there is no fossil evidence that proves it,‭ ‬and that‭’‬s the key thing about interpreting behaviour for long extinct animals,‭ ‬proof.‭ ‬Despite the vast amount of fossils for Psittacosaurus,‭ ‬there is still much that we could potentially learn about Psittacosaurus behaviour,‭ ‬yet on the flip side to that we might never find out anything else.‭ ‬But some later genera of ceratopsian dinosaurs have been found in vast bone bed concentrations that contain the remains of hundreds,‭ ‬perhaps even thousands of individuals that died together in the same location in a short space of time,‭ ‬indicating that at least some later ceratopsians lived in groups.‭ ‬It is conceivable that Psittacosaurus may have travelled around in groups,‭ ‬even if only in loose concentrations building up where food was most abundant. As far as predators for Psittacosaurus go the obvious choice of potential threats would be from the dinosaurs that were roaming around at the time,‭ ‬perhaps particularly dromaeosaurids,‭ ‬small theropods that were very fast and with‭ ‬the perfect adaptations for taking down small orntihischian dinosaurs like Psittacosaurus.‭ ‬Prehistoric crocodiles‭ ‬could have‭ ‬also‭ ‬been a threat,‭ ‬especially when you consider that they came in a great many more diverse forms in the early Cretaceous.‭ ‬Most significantly though was the discovery of a triconodont mammal named Repenomamus robustus that had the remains of a small juvenile Psittacosaurus within what would have been its stomach.‭ ‬This juvenile Psittacosaurus was preserved in articulated chunks which means that after the Repenomamus caught the‭ ‬Psittacosaurus it pulled it apart and swallowed it in chunks.‭ ‬This was the first discovery of a mammal eating a dinosaur and‭ ‬is undeniable evidence that by the early Cretaceous the mammals had evolved to a point that they were capable of hunting smaller dinosaurs. - Juvenile specimens of the ornithischian dinosaur Psittacosaurus. - Palaeontology 25: 89–107. - Walter P. Coombs - 1982. - Psittacosaurus meileyingensis (Ornithischia: Ceratopsia), a new psittacosaur from the Lower Cretaceous of northeastern China. - Journal of Vertebrate Paleontology 8: 366–377. - Paul C. Sereno, Zhao Xijin, Chang Zhengwu & Rao Chenggang - 1988. - Psittacosaurus xinjiangensis (Ornithischia: Ceratopsia), a new psittacosaur from the Lower Cretaceous of northwestern China. - Journal of Vertebrate Paleontology 8: 353–365. - Paul C. Sereno & Zhao Xijin - 1988. - A new species of the ornithischian dinosaur Psittacosaurus from the Early Cretaceous of Thailand. - Palaeontology 35: 801–812. - Eric Buffetaut & Varavudh Suteethorn 1992. 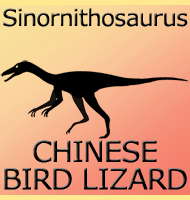 - New psittacosaur occurrences in Inner Mongolia. - Canadian Journal of Earth Sciences 33: 637–648. - Dale A. Russell & Zhao Xijin - 1996. 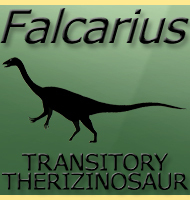 - Psittacosaur fossils and their stratigraphical implications. In: Wang Y. & Deng T. (Eds.). 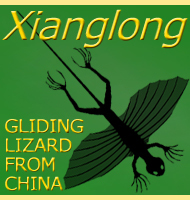 - Proceedings of the Seventh Annual Meeting of the Chinese Society of Vertebrate Paleontology. Beijing: China Ocean Press. Pp. 75–80. - Xu Xing & Zhao Xijin - 1999. - Growth curve of Psittacosaurus mongoliensis Osborn (Ceratopsia: Psittacosauridae) inferred from long bone histology. - Zoological Journal of the Linnean Society 130: 551–566. - Gregory M. Erickson & Tatyana A. Tumanova - 2000. - The occurrence of Psittacosaurus xinjiangensis Sereno and Chao, 1988 in the Urho area, Junggar basin, Xinjiang. - Canadian Journal of Earth Sciences 38: 1781–1786. - Donald B. Brinkman, David A. Eberth, M. J. Ryan & Chen Peiji - 2001. - Bristle-like integumentary structures at the tail of the horned dinosaur Psittacosaurus. Naturwissenschaften 89: 361–365. - Gerald Mayr, Stephan D. Peters, Vogel Herhard & Olaf Gerhard - 2002. - Remarks on Psittacosaurus sattayaraki Buffetaut & Suteethorn, 1992, a ceratopsian dinosaur from the Lower Cretaceous of Thailand. - Oryctos 4: 71–73. - Eric Buffetaut & Varavudh Suteethorn - 2002. - Parental care in an ornithischian dinosaur. - Nature 431: 145–146. - Meng Qingjin, Liu Jinyuan, David J. Varrichio, Timothy Huang & Gao Chunling - 2004. 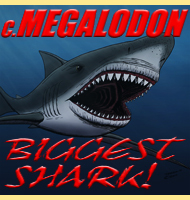 - Large Mesozoic mammals fed on dinosaurs. - Nature 433: 149–152. - Hu Yaoming, Meng Jin, Wang Yuanqing & Li Chuankui - 2005. - A new species of Psittacosaurus (Dinosauria: Ceratopsia) from the Early Cretaceous Yixian Formation, Liaoning, China. - Palaeoworld 15: 100–114. - Zhou Changfu, Gao Keqin, Richard C. Fox & Chen Shuihua - 2006. - A ceratopsian dinosaur Psittacosaurus sibiricus from the Early Cretaceous of West Siberia, Russia and its phylogenetic relationships. - Journal of Systematic Paleontology 4(4): 359–395. - Alexander O. Averianov, Alexei V. Voronkevich, Sergei V. Leshchinskiy & Alexei V. Fayngertz - 2006. - The Psittacosaurus biochron, Early Cretaceous of Asia. 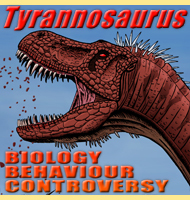 - Cretaceous Research 27: 189–198. - Spencer G. Lucas - 2006. 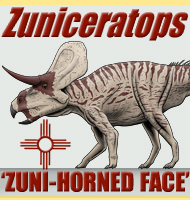 - Analysis of forelimb function in basal ceratopsians. - Journal of Zoology 273: 305–314. - P. Senter - 2007. - Social behaviour and mass mortality in the basal ceratopsian dinosaur Psittacosaurus (Early Cretaceous, People's Republic of China). 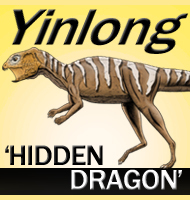 - Palaeontology 50(5): 1023–1029 -Q. Zhao, P. M. Barret & D. A. Eberth - 2007. - A new Psittacosaurus (Dinosauria: Ceratopsia) specimen from the Yixian Formation of western Liaoning, China: the first pathological psittacosaurid. - Cretaceous Research - Kobayashi L� Junchang, Lee Yuong-Nam Yoshitsugu & Ji Qiang - 2007. 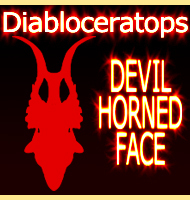 - New psittacosaurid highlights skull enlargement in horned dinosaurs. - Acta Palaeontologica Polonica 52(2): 275–284. - Paul C. Sereno, Zhao Xijin, Loren Brown & Tan Lin - 2007. - New data on cranial anatomy of the ceratopsian dinosaur Psittacosaurus major. - Acta Palaeontologica Polonica 53(2):183–196. - Hai-Lu You, Kyo Tanoue & Peter Dodson - 2008. - A new psittacosaur from Inner Mongolia and the parrot-like structure and function of the psittacosaur skull. - Proceedings of the Royal Society B 277(1679):199–209. - Paul C. Sereno, Zhao Xijin & Tan Lin - 2010. 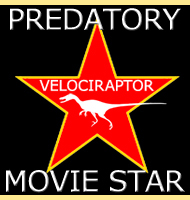 - Juvenile-only clusters and the behaviour of the Early Cretaceous dinosaur Psittacosaurus. - Acta Palaeontologica Polonica. - Q. Zhao, M. J. Benton, X. Xu & M. J. Sander - 2012. 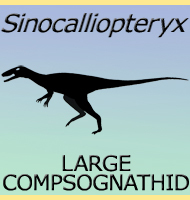 - Lujiatun Psittacosaurids: Understanding Individual and Taphonomic Variation Using 3D Geometric Morphometrics. - In Evans, Alistair Robert. PLoS ONE 8 (8) - B. P. Hedrick & P. Dodson - 2013. - Histology and postural change during the growth of the ceratopsian dinosaur Psittacosaurus lujiatunensis. - Nature Communications - Qi Zhao, Michael J. Benton, Corwin Sullivan, P. Martin Sander & Xing Xu - 2013. - Juvenile-only clusters and behaviour of the Early Cretaceous dinosaur Psittacosaurus. - Acta Palaeontologica Polonica - Q. Zhao - 2013.